Welcome to the brand-new blog series from PTS and mindset expert Ross McWilliam. Over the next four weeks Ross will be guiding us through introducing growth mindset in primary schools. 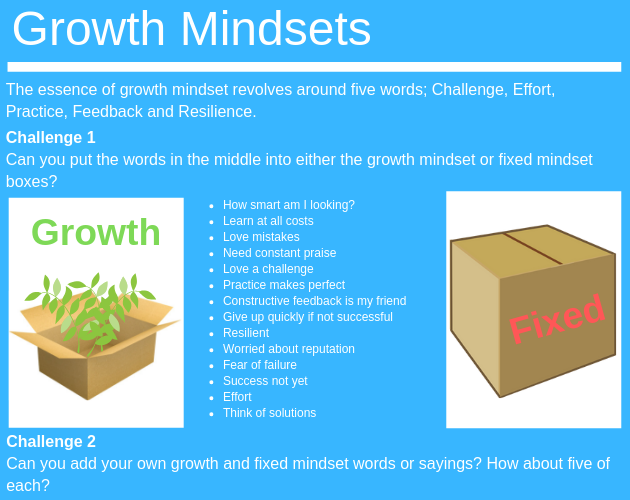 This week, Ross will be introducing the series and then giving you ideas on how to encourage pupils to create their own definitions of growth mindset and what it means to them. By now, most schools will be aware of the concept of Growth Mindset (GM). Equally, many schools may well have implemented aspects of GM either across classroom teaching or via school specific cross curricular methods. Some may well have a whole school approach that involves parents and outside agencies. Wherever you are on the awareness and implementation of GM, this series will provide thoughts that may help you along the way. Within this four-part series, I will detail the key considerations of implementing a GM policy with some practical tips about what schools can do at pupil level, classroom/cross curricular level, and a whole school approach. A successful GM strategy will actively involve all key stakeholders including outside agencies/partners, parents and staff. A strategic school GM policy will allow for regular ‘tweaks’ in the performance and review of the strategy, whilst still allowing the involvement of key stakeholders. Indeed, a healthy GM strategy may well evolve into a real ownership by all the key stakeholders. Part 1: A combination of concepts and ideas to allow pupils to find their own definitions of GM, what GM means to them, and how they can identify and improve it. Part 2: The value of intrinsic and extrinsic rewards, along with specific praise and feedback language to be used. Identification of measures to record progress in terms of attendance, rewards and sanctions, grades, school/class attitude. Part 3: A whole school strategy that caters for key stakeholders of parents and staff, and how to monitor progress at school and at home. Part 4: Consideration must also be given to those pupils who may have difficulty initially accessing GM and those who might need more support as they encounter barriers to learning on their GM journey. Resistance can often be met when anything new is put on the agenda, as most people don’t like change. There may be preconceptions of what GM means and assumptions that it takes more effort, time and resources in an already busy school schedule. One of the secrets to implementing a successful GM programme is to not only clearly define what it means, but to demonstrate how it could positively affect all aspects of school life and beyond, for all the key stakeholders of pupils, parents and staff. The concept of mindset was engineered by Carol Dweck after decades of researching achievement and success. Her research was able to prove that the way we think, and therefore behave, has a massive impact on learning and attitude. She classified mindset into Growth or Fixed. In a Fixed Mindset people believe their intelligence and talents are fixed traits, set at birth and there is little you can do to improve these qualities. In a Growth Mindset, people believe they can improve their intelligence and talents through purposeful effort, accepting guidance and support, and dedication to improvement without comparison to others. People with a Growth Mindset believe that anything is possible over time. Dweck also stated that there were some people (15%) who have both fixed and growth mindset qualities. Crucially, those who possess a GM have a happier and more successful life. There is actually evidence to support this claim! A useful first step for pupils would be to talk about the development of the qualities of intelligence and talent. Personally, I would start this off with a pre-definition of intelligence and talent. To me, intelligence or talent are polarised and loaded words. Children as well as adults, when asked ‘Are you intelligent?’, often immediately answer either yes or no. Perhaps this has been inculcated into their lives by various people complimenting them (or not). As we will find out in Part 2 of the series, praise and feedback, even if well intentioned, can have covert and overt negative effects on personal development. 1. No negative self-bias when faced with challenges (I can’t do maths, I am rubbish at school). 3. Getting support, guidance and feedback from others. 4. Using purposeful effort and perseverance/resilience to find a solution.5. Not comparing with others or fearing judgement. Carol Dweck uses the term ‘not yet’ to describe someone who does not quite reach a required measured standard. So rather than seeing a fail on a maths test, it should rather be seen as not passing yet. All it needs is the key GM components applied over time. ’If you don’t give up, it can’t be failure, it’s just ‘success-not-yet.’ The method of reinforcing this message can take many formats. Firstly, I would use current news media stories to identify where GM has been demonstrated using the 5 GM method. The recent 2016 Rio Olympics might be a useful starting point for talent examples. For example, ask pupils to find stories of athletes who have developed their GM to either be successful in medalling, or simply by just being at the Olympics. Using the 2016 Rio Paralympics may very well allow pupils to uncover some additional astonishing GM stories! Cyclist, Becky James, was a keen young cyclist. Her career only really started to take off when she was identified as having potential to succeed at a higher level, but it was only potential at this stage. With guidance and support from British Cycling, along with her determination, she started to achieve success, but only after finding out which event suited her ability best. She had to overcome many ‘success-not yet’ races and had to battle glandular fever, and even had a cancer scare! In terms of Paralympic, or simple wins over adversity examples, there are numerous instances where a GM attitude has triumphed. Cases such as Ellie Simmonds, Jonnie Peacock, Alvin Law, Rick Hansen, et al can be found on the internet, even used as starter projects to identify what GM talent development really means. • Light Bulb inventor, Thomas Edison, was told he was too stupid to learn anything and should go into something that his pleasant personality might be better suited to! • Entrepreneur, Richard Branson, who lost his entire savings four times before his innovative ideas and actions helped him become a billionaire. • Norman Larsen the creator of WD 40. There are countless examples of both talent and intelligence GM stories, many of which are documented in the references along with some short videos. However, the real secret is to use examples or role models not only specific to the needs/inspiration of the child (talent or academic), but specific to their contemporary world i.e. their real-world relevance. This might take on slightly less orthodox examples such as the struggles and success of Eminem, Demi Lovato, Lionel Messi, Lizzy Yarnold. At the younger end of KS2, the inspirational role models may even come from cartoons depicting the struggles and success of characters such as Elsa from Frozen, or Carl and Ellie from Up. Once the concept of GM is better understood, the next step would be to ask pupils to create their own definition of what GM means to them. Once this ownership of GM is accomplished, the next task is to identify model GM behaviours/statements and non-model FM behaviours/statements. Younger children often learn what the right response is by comparing to the wrong opposite response i.e. the non-model approach. The following model/non-model exercise can be done with many pupils at the higher end of KS2, but may need to be simplified for the lower end. Alternatively, lower end KS2 may be all about feedback, praise and a simple set of GM definitions which is featured in part 2 of this series. Above I have taken the five GM concepts and made them into the five words of Challenge, Effort, Practice, Feedback, Resilience. From a teacher’s viewpoint, it is important to keep it simple, but not simplistic. Therefore, by all means, let pupils think in these simple terms, but use your skills to reference and demonstrate negative self-bias, fear of being judged, extra effort is a good thing, etc. Just refer back to the full 5GM list. Another common error in implementing 5 GM is to simply tell pupils to work harder i.e. more effort. Sometimes when pupils are met with this one-dimensional response it can be a trigger to ‘go back in their shell’, let’s get distracted or even keep plodding on until all motivation is used up. This is where specific guidance or feedback is needed either by the teacher, peers, self or a combination of sources. The following table is adapted from a book by Barry Hymer and Mike Gershon (2014) which looks at effort feedback. 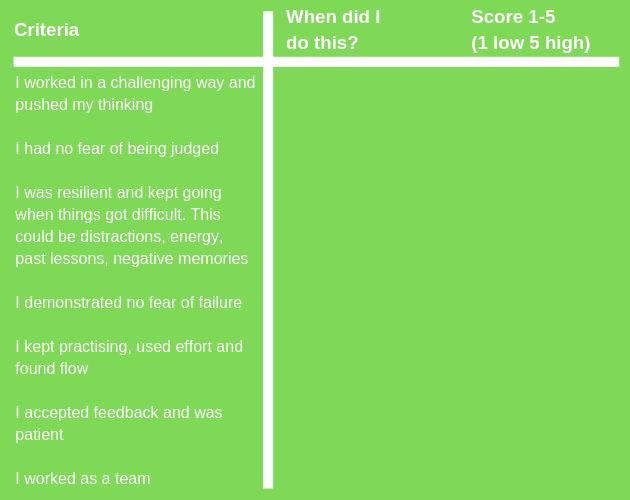 I use this adapted table to help self and peer assessment in terms of effort. A fun way is for paired pupils to self-assess first and then ask a peer to assess them! Again, for lower end KS2 you may wish to simplify words based on your knowledge of your pupils. Finally, using the same principles outlined by Hymer and Gershon, there are excellent examples of how to use metacognition feedback (thinking about thinking) which are ideal for higher end KS2 in terms of getting pupils to use prompt thinking boxes to obtain better outcomes. In essence, GM is all about uncovering potential to discover talent. We can now start this process by using the guidance above. Dweck, C. (2012) Mindset: How You Can Fulfil Your Potential. Robinson Publishers. New York. Hymer, B. and Gershon, M. (2014) Growth Mindset Pocketbook. Teachers’ Pocketbook Publishers. Alresford, Hampshire. Ricci, M.C. (2013) Mindsets in the Classroom.Prufrock Press. Waco, Texas. Various ideas and concepts have been taken from my new books The Amazing Journey Of CUPPA – His Quest to Find the Five Secrets of the Confident Mindset which is due out in Autumn. It features several role models for talent and intelligence role models with embedded video links. Please email me if you would like further information/video links.